The article below was published in the January issue of Red Star, the monthly newspaper of the United Socialist Party (CWI) in Sri Lanka. The party’s general secretary, Sritunga Jayasuriya, outlines the mounting tension in the country as the government, led by the United National Party, tries to force through harsh neo-liberal economic reforms. The president, Maithripala Sirisena, and his supporters in the SLFP (Sri Lanka Freedom Party) are working together with the UNP in their onslaught against workers and students. Standing outside this so-called “national government” is a part of the SLFP led by the former dictatorial president, Mahinda Rajapaksa. Ousted in elections two years ago, he is ominously using this opportunity to regain support by employing populist rhetoric against the UNP policies, married with nationalist and chauvinist propaganda. This has further exaggerated the national tension that exists between the majority Sinhalese and the Tamil-speaking peoples. An added complication is that the Tamil-based right wing nationalist party – the Tamil National Alliance (TNA) – supports the current government and its policies, despite holding the position of leader of the opposition in parliament. However, there are now signs of struggle beginning to emerge, particularly among the students and militant sections of the working class. The article outlines some of the key recent developments. On January 8, 2017, two years had elapsed since Maithripala Sirisena became the president of Sri Lanka amid challenges and crises. These two years were spent basically lashing the villain that was Mahinda Rajapaksa. Yet the Mathri-Ranil administration has miserably failed to investigate the large quantity of corruption cases, frauds, abductions, disappearances of people and extra-judicial killings that happened during the period of family rule by the Sinhala nationalist Rajapaksa regime. Meanwhile there are serious allegations of fraud and corruption now being leveled against this government and the bonds scam at the Central Bank is very conspicuous among them. Now, those organisations who broke away from their parties and supported Maithri in the presidential election – NGOs , some trade unions, sections of the Samasamaja party, Communist Party and the Nava Samasamaja party – are in a dilemma and they find it difficult to defend the government. As the government came to power, it had to face an economic crisis. To alleviate this, the government was struggling to find solutions and compelled to appeal for a standby facility of 1.6 billion dollars from the IMF to avert a crisis in the balance of payments. The government agreed to the conditions laid down by the IMF to put the burden on the people. One of the main proposals was to increase the VAT, which has already been tormenting the ordinary people, from 11- 15%. The world capitalist economy is stagnating and growth is declining in many countries. An economic upswing cannot be expected in America, France, Germany, China or India in these circumstances. The economic mega plans of Ranil Wickremasinghe have to be considered against the backdrop of this world crisis situation. Though it was anticipated that there would be 6% economic growth in 2016 in Sri Lanka, now it is reported that it could be as low as 4%. The year 2016 was the year when the foreign currency reserves of the country deteriorated most in the last five years. By December last year, foreign currency reserves were $5.64bn. In 2015, export income was $10.5bn dollars and in 2016 this figure came down to 10.3bn. Another significant feature of this crisis is that the foreign exchange ratio of Rs 144 to a dollar increased to 151 per dollar. In 2015 the amount of debt of the country was $8,500bn. ; by the end of 2016, the debt of the country had increased to $9,400bn. As a whole, the economy in the country is in deep crisis. The government has failed to achieve the anticipated annual economic growth. Unemployment is fast increasing and the discontent among the youth is growing. The cost of living has risen so much that the working class, poor peasants and the lower middle class people find it difficult to live. With this situation one can easily see the seriousness of the economic crisis. Prime Minister Ranil Wickremasinghe’s plan to face this economic crisis is adopting neo-liberal policies – opening the doors to foreign investors and doing away with all the protective measures of the state. 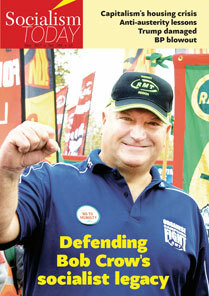 As a first step in this process the government is planning to curb the trade union rights that the working class has. One of the key proposals is to amend the law that stipulates that employees cannot be sacked without the sanction of the labour department except for disciplinary reasons. During the period when left forces were strong in the country, the working class was able to win such concessions – an important step in relation to other countries in the South Asian region. We emphasise that any recent development has been “so-called” development, based as it has been on the straitjacket of the neo-liberal model. The human tragedy that unfolded at the time of the conclusion of the civil war was such that it could not be described in words. Issues such as children without parents, wives without husbands, those who lost their limbs, those who lost their dwellings and property and those who disappeared all still remain unresolved matters affecting the day to day lives of the people. The vast majority of the people in the North and East voted to defeat Mahinda Rajapaksha in the hope that a Maithri – Ranil administration would move without delay to solve these problems. Resolution of the national question and solving the burning issues of all the people should be considered separately. However, even after two years in office Maithripala has failed to offer solutions to the day-to-day problems of the people. Maithri has repeatedly pledged that he would take steps to enact a new constitution to abolish the executive presidency and devolve power in order to solve the national question. But now it has become a big challenge for him even to make some amendments to the Constitution, let alone enacting a new one. The main demand of the Tamil National Alliance has been the creation of a federal-type region (in the area they consider to be the Tamil Homeland) by merging the Northern province, where the Tamils are the vast majority, and the Eastern province where Tamils, Muslims and Sinhalese live in equal ratios Another main demand is that the provincial administration should have the power in respect of police (below the rank of Assistant Superintendent of Police) and the utilisation of government land. The Constitution for the Republic which was drafted by Dr. Colvin R. de Silva, a Samasamaja leader, and enacted by the Coalition government of the SLFP – Samasamaja – Communist in 1972 gave Buddhism the foremost position and the Republic was made a unitary state under which no devolution of power to the provinces was possible. Against this background the Tamil people demanded that their concept of the state being a united country as opposed to a unitary one should be accepted, that Buddhism or any other religion should not be given any prominent place and that the state should be a secular country like India. A constitutional amendment normally needs a 2/3 majority in the legislature, but that majority is not adequate to enact a new constitution with provisions for limited power-sharing as a step towards solving the national question within the limits of bourgeois democracy and a referendum has to be held to pass such a provision. The aim of the Rajapaksha clique is to create a frightening communal commotion under the pretext that the country would be divided if such a referendum was held. History shows that the capitalist leaders of this country are not capable of taking action to solve the national question. The ruling class has been forced to arrive at various agreements with right wing nationalist Tamil leaders since 1952 due to the crisis they were facing. The Maithri – Ranil Regime is also facing pressure locally and internationally to take some even token action to contain the national question for the time being. Against this backdrop, if the government brings forward a proposal for some sort of power-sharing, Marxists would be faced with the twin tasks of fighting against the frightful Sinhala nationalist racist campaign on the one hand and providing leadership to the working class and other oppressed peoples fighting the Regime which is trying to carry forward the neo-liberal global capitalist project on the other. Such a situation would be a challenge for Marxists and an emerging insurrectionary situation might surpass the racist terror of 1987-89. Communalist forces are using the declining popularity of this ‘Good Governance’ government to their advantage. However the TNA leaders, including Sambandhan and Sumanthiran, have discarded their basic tenets and agreed for a unitary constitution, granting the foremost place to Buddhism, at the sub-committee meetings of the Constitutional Assembly consisting of all the members of Parliament. Nevertheless the majority of neither Sinhalese nor Tamils know about this development. 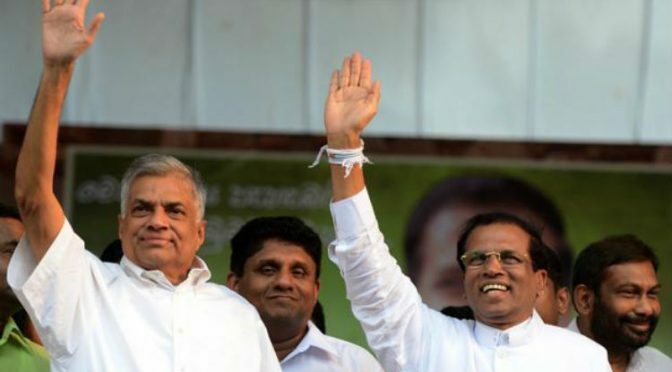 Even under this situation it is evident now that the UNP – SLFP coalition government does not have the capability or strength to go for abolishing the executive presidency or a constitutional amendment in the direction of finding some solution to the national question within the limits of bourgeois democracy. In the face of communalist forces, Maithri and Ranil are going back on pledges made in this respect. It is clear that this government is not capable of traveling the distance travelled by JR Jayawardana in enacting the 13th Amendment which created the provincial council system in respect of solving the national question. We emphasise that the struggle of the Tamil people in the North, East and central highlands for their rights and national aspirations should be bound together with the struggle of workers and the oppressed in the South for democratic rights and enhancing the living standards. During 1987, when the war was accelerating in the north, Rajiv Gandhi and J R Jayawardena signed the Indo- Lanka Accord stating that this was an important step to rescue the country. Apart from the JVP-led so-called patriotic movement and related terror campaign, all other capitalist leaders generally agreed to that. But up to date, no capitalist government was able to implement fully the 13th Amendment since 1987. When Rajapaksa became the president of the country in 2005, and when he contested the presidency again in 2010, he openly expressed several times to the local and foreign media and also to India that he is ready to grant the powers vested in the 13th Amendment and prepared to give more powers. He used the term 13+ (thirteen plus). The person who said this when he was in power, that is Mahinda Rjapasksha, is, together with his communal clique, now saying that if the 13th Amendment is going to be implemented, that is the end of the country. The Rajapaksha clique who lost both the presidential and general elections in 2015 is so greedy for power that they are ready to re-ignite the flames of Sinhala Buddhist communalism. It is clear that they want to come to power by hook or by crook to avoid being sent to the gallows for the murders of journalists Lasantha Wickrematunga and Prageeth Eknaligoda. And the accusations for the large scale of corruption, robbing of public funds and abductions (in the culture of the white van). The Rajapaksa clique which is unable to stand up against, or put forward an alternative programme to the present neo-liberal economic policies of the present government, is trying to come to power by burning the country with communal forces in the south . The present government is becoming highly unpopular among the ordinary masses because it is trying to impose austerity measures and take away people’s rights, following the dictates of the World Bank and the IMF. It is thereby paving the way for the communal forces led by Rajapaksha, Weerawansa, Dinesh Gunawardena and Vasudeva .This clique is trying to derail working class struggle with so-called patriotic communal politics. The statement made by Dinesh Gunawardena in parliament that there could be a military coup on the agenda and the recent statement by Mahinda Rajapaksha that there could be a change of heads in the parliament in 2017 and that a new government will be formed should not be underestimated. The Maithri- Ranil government is not capable of facing up to the challenge posed by these communal forces. The only force which can counter this immense offensive is the organised working class with left forces who stand up for the right to self-determination for the Tamil people. As a whole, amidst the deep crisis faced by the capitalist state’s system Maithripala has not been able even to create the democratic environment promised during the run-up to the last election on January 8th. Instead the practice of military and police suppression has again come to the fore. In fact the suppression of the port workers’ struggle at Hambantota and the workers’ and people’s struggle against the proposed devolvement plan for Hambantota is a dress rehearsal for what is to be expected in the future. At present the traditional poor farmers of that area are campaigning against the proposal to hand over 15,000 acres to China. The present government has invited foreign capital in as the only saviour for the economic ills. To put neo-liberal austerity policies into action they are now contemplating steps to introduce new suppressive measures against the working class and the poor which will uproot the rights of the working class won through hard struggles. There was a proposal in the last Budget to have a five day working week with 45 hours of work. This is an underhand way of exploiting workers more and should be defeated. The trade unions should counter this proposal with the demand for a 5 day working week with 35 hours of work. On the other hand the government is now using the courts to prevent workers from taking trade union action in a clear violation of their fundamental rights. Working class militants should campaign for trade unions to collectively take decisions on common issues like these to stop an erosion of workers’ rights. The challenge before the left and the trade unions is how to meet this situation. After the defeat of the 1980 general strike the trade union movement has remained in disarray, still unable to overcome the consequences. Though some trade union leaders have moved to act in some form of united framework they are still not prepared to build a common centre which could act and take decisions for the betterment of the working class through struggle. The efforts made by several trade unions to celebrate the international workers’ day (May Day) is a step forward. But it is not sufficient for facing up to the suppression which could be unleashed by the ruling class against the trade unions, workers, farmers and students engaged in struggle. It is necessary to begin a dialogue of rank and file activists even for a union centre where trade union leaders could and should meet regularly and take decisions collectively and democratically on matters affecting the working class. The challenges which could emerge during this year can only be faced successfully if a joint centre can be formed that will integrate the working class, oppressed farmers and students struggles together. Previous PostWe were part of the History in the Making!Next Post‘Jallikattu protests’ – People locked horns with the Establishment!